Pianist, composer and journalist Peter Hum, a native of Ottawa, Canada, lives in his hometown and is assistant Editor of Art & Life (meaning he reviews restaurants as well as music) coverage for the Ottawa Citizen (go to jazzblog.ca). Mr. Hum is quite an accomplished musician, having gigged with the likes of guitarist Sonny Greenwich, saxophonist Pat LaBarbera and reed player Phil Nimmons. He gigged regularly in Montreal during his days at McGill University (the mid-1980s) and has been leading or co-leading groups in Ottawa since the mid-1990s, all the while working full-time as a journalist. His debut recording as a leader, "A Boy's Journey", was issued in late 2010 (my review is here) and now, nearly 5 years later, is joined by "Alpha Moment" (self-released). This recording, from sessions in late December 2011), features the same band as the debut - Kenji Omae (tenor saxophone), Nathan Cepelinski (alto and soprano saxophones), Alec Walkington (bass), Ted Warren (drums) - plus guitarist Mike Rud. And, like the debut CD, the music on the new recording is also filled with impressive melodies, smart interactions between the musicians, and strong solos. I like the cool drive of the rhythm section, how they propel the music forward on tracks such as "Voice From Afar" (with Cepelinski's soaring soprano sax taking centerstage alongside the exploratory tenor sax) and the high energy of "The Good Fight" that opens the album (here as well, Cepelinski - on alto sax - and Omae stand out with fiery solos.) The title track opens with guitarist Rud in a short duet with Hum, playing a melody that sounds influenced by the work of Lyle Mays and Pat Metheny - when the rest of the band enters, the music picks up in intensity and Omae digs into a pleasing solo again followed by the alto saxophonist hot on his heels. Pay attention to Warren's explosive drumming and how Rud leads the piece out, slowing down the pace, again working with Hum as the saxes reprise the melody. There's a sweet, gentle, touch to "La Tendresse, s.v.p. ", the interactions of Cepelinski (alto sax), Rud and Hum emphasize the fine melody and harmonies. Bassist Walkington delivers a powerful and melodic solo (at times, with phrases - echoed by the leader in his impressive turn - reminiscent of Henry Mancini's "The Days of Wine and Roses." "Saddest Day of the Year" closes the program in a quiet, introspective, mood, with the guitar and piano sharing one part of the melody and Omae the other. As the piece opens up, the guitar and tenor sax move around in a forceful dance that resolves with the entrance of Cepelinski's soprano. When you listen again, you realize that the composer has given everyone but the drummer the opportunity to play all or part of the melody. "Alpha Moment" is a generous album, generous in spirit, in melodies, in solos, adult music that flows ever-forward on the strength of 6 fine musicians. While Bruce Deachman's cover image captures a roller coaster just as it is about to make a rapid descent, Peter Hum and company never seem out of control (although there are moments on "Bon Vivant" when the band seems to really fly - listen below). This is joyous music worthy of your attention. For more information, go to peterhum.com. For a reviewer, there are no greater pleasures than when your favorite artists puts out a new recording and it's his/her best or when you hear a recording by a group you never heard before and you are swept off your feet. The latter experience is what I have had listening to "Holmes", the debut CD by the 17-piece Jeff Benedict Big Big Band (Maroon Creek Music/Tapestry. Mr. Benedict is a Professor of Music at California State University in Los Angeles. He plays soprano and alto saxophones in several different groups including the Dave Askren/Jeff Benedict Quartet as well as other groups in the LA area. His Big Big Band is a fairly new aggregation yet it's made up of musicians Benedict has known for many years. From the loud brass exclamation that opens "Come On In", this music hits a groove and rarely lets go. Powered by the rhythm section of Paul Romaine (drums) and Tim Emmons (bass), this is a group that likes to groove. The slinky, funky, version of Juan Tizol's "Caravan" romps alongside the rock-infused reading of Pat Metheny's "Jaco" (love the WSQ-like opening of saxes, brass and electric bass). There's another touch of World Saxophone Quartet in the playful arrangement of Michael Brecker's "Delta City Blues"(Brecker's version has a similar feel with 1 saxophone instead of 5) that, once the rhythm section enters, makes a beeline for New Orleans. That Crescent City jump also permeates the leader's composition for his father which is the title for the album. Benedict shares the solo spotlight with baritone saxophonist Charlie Richard, trumpeter Tom Tallman and trombonist Paul McKee. That's not to say that the band doesn't have a sweet way with a ballad. The trombone section, led by bass trombonist Gerry Amoury, leads the rest of the band into a bluesy take of "Easy Living." The body of the piece serves as a dialogue for Benedict's alto sax and the smooth trombone of Paul McKee as well as a fine use of the horns and brass, both as color and to play counterpoint. "Naima", the John Coltrane classic, is given a Latin treatment and is more up-tempo yet the arrangement emphasizes the melody, first played by the brass then adding the reeds for counterpoint and then switching so the reeds lead for a short while and back again. There's a strong trumpet solo from Jeff Jarvis over the pulsing rhythm section followed by a energetic turn from guitarist Dave Askren. Drummer Romaine take a short, understated, solo before the entire band returns to play a short give-and-take with the drummer and then a re-statement of the theme. "Holmes" is no mystery but a solid effort all around by a 17-piece group of friends (kudos as well to conductor David Caffey). 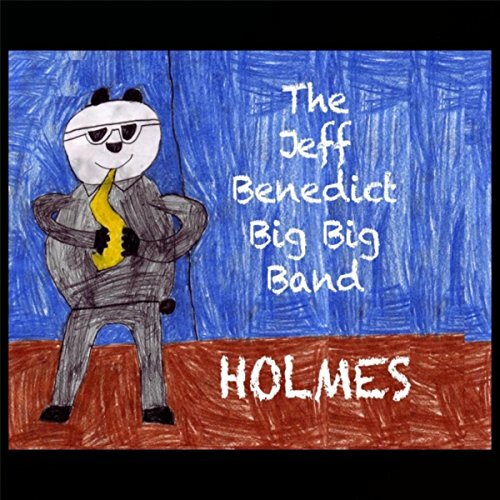 The Jeff Benedict Big Big Band makes enthusiastic music without resorting to excess high notes, extended solos or swagger - this is a fun album from start to finish. For more information, go to marooncreekmusic.com and follow the links. Click here to see a list Big Big Band members. Yes, I know it's late notice but this is going to be one heck of a party as well as a musical "family reunion"! And you can watch live by signing up at www.smallsjazzclub.com. Been 3 weeks since I posted any items here (still somewhat active on twitter -@rbkmusicofwine) - school has started, family issues abound, and life sometimes gets in the way. There have been numerous great shows but there is more to come (as evidenced below). Firehouse 12 in New Haven, now 3 weeks into its Fall 2015 season, presents Bryan & The Aardvarks for your listening pleasure this Friday October 2. The leader is bassist and composer Bryan Copeland while The Aardvarks include Chris Dingman (vibraphone), Joe Nero (drums), Jesse Lewis (guitar) and Julian Shore (subbing for Fabian Almazan on piano). As you might be able to tell from the instrumentation, this band focuses on melody but not at the expense of improvisation but as a basis for sonic explorations. Their 2011 debut CD, "Heroes of Make Believe", consisted of 12 tracks, 8 composed by the leader and 4 group improvisations. The band is currently preparing its sophomore effort for release in the next few months. Bryan & The Aardvarks will play 2 sets - 8:30 and 10 p.m. (separate admission fee for each set). For more information, go to firehouse12.com or call 203-785-0468. To lear more about the group, go to www.bryanandtheaardvarks.com. Saxophonist, composer and educator Javon Jackson (currently the Director of Studies at the Hartt School's Jackie McLean Institute of Jazz in Hartford) glides down CT Route 9 South for a 2-night gig at The Side Door Jazz Club in Old Lyme. Joining Professor Jackson will be jazz greats Louis Hayes (drums), George Cables (piano) and Santi DeBriano (bass). Considering the careers of these 4 musician, there should be a wealth of material to be played on both Friday and Saturday nights. Jackson is a fluid tenor saxophonist whose original music shows the influence of great masters such as Art Blakey and Wayne Shorter but also Nat "King" Cole and Stevie Wonder. As for Messrs. Hayes, Cables, and DeBriano, this rhythm section has worked with most of the important jazz musician of the past 5 decades plus issued excellent albums of their own. Doors open at 7:30 p.m. with the Jackson 4 hitting the stage at 8:30. For more information, go to thesidedoorjazz.com or call 860-434-0886. The Uncertainty Music Series continues this Saturday at 3 p.m. in G Cafe, 141 Orange Street in New Haven. The concert features Broadcloth - the trio of Annie Rhodes (voice), Adam Matlock (recorders, accordion) and Nathan Bontrager (cello) - in a CD Release event. The ensemble's 5th album, "In Stitches", is released this week and is a compilation of sessions from 2011 - 2012. The music, inspired by the likes of Meredith Monk and Anthony Braxton, goes in varied directions, often where one least expects, surprising, challenging, and often fascinating. For more information about the trio, go to broadclothtrio.com. Opening the show is a solo set from saxophonist and Hartford-area resident Richard McGhee III. Mr. McGhee has a long and impressive career as an improvising musician, one who is not afraid to take chances and who plays with both great fire and delicacy. In the 6+ years since coming out of a medically induced 2-month coma caused by the onset of sepsis after a severe bout of pneumonia, pianist-composer Fred Hersch has been extremely busy. He has created an a jazz/theater piece titled "My Coma Dreams", issued a live solo recording (from his week-long residency at The Village Vanguard in 2010, released 3 CDs with his Trio, a duo recording with guitarist Julian Lage, and has created a new theater piece titled "Room of Light." He's also produced a number of CDs including the first 2 efforts by pianist Nick Sanders. In October 2015, Fred Hersch turns 60 years old and is celebrating by releasing "Solo" (Palmetto Records). Recorded live in August 2014 in Windham, NY (140 miles due north of New York City), the 7-song program runs the musical gamut from originals (2), a medley of 2 pieces from Antonio Carlos "Tom" Jobim, a wondrous re-imagining of Juan Tizol's "Caravan", a heart-stopping, heart-breaking, reading of Jerome Kern's "The Song Is You", the obligatory but not desultory Thelonious Monk song ("In Walked Bud"), closing with an emotionally rich reading of Joni Mitchell's "Both Sides Now." One imagines that Ms. Mitchell's lyrics really resonate with the pianist, verses such as "But now old friends are acting strange/They shake their heads, they say I've changed/Well something's lost, but something's gained/In living every day." Yet, Mr. Hersch does not create a vapid performance or try to pull out new meanings; instead, he caresses the melody in the first few verses and then stretches out, coming back to the melody for a gentle finish. Of the 2 originals, "Pastorale" was on his previous solo recording. Dedicated to composer Robert Schumann (1810-1856), the music manages to sound jazz and classical music at the same time, moving aways from and back to the original melody and chords with a delicate intensity. "Whirl" was the title track of the pianist's 2010 Trio CD, the first recording after his recovery. Composed as a tribute to ballerina Suzanne Farrell, the work has great drive, a tour-de-force with out sounding forced. As I sit on our back porch, with the playful sounds of "Caravan" punctuated by bird songs, it's easy to feel safe wrapped in the warm sounds of "Solo." The world beyond the street on which our house is located is often dark, occasionally dangerous and can be fraught with anxiety. The music of Fred Hersch gives this listener hope, the possibility that art - in this instance, music - can lift one above the fray, if only for an hour or 2. For more information, go to www.fredhersch.com. Guitarist/composer Mary Halvorson continues to surprise and amaze listeners. She leads or co-leads a number of ensembles while playing with a number of creative artists ranging from Anthony Braxton to Ingrid Laubrock to Jacob Garchik to Stephan Crump and beyond. Her new CD, "Meltframe", is her 5th for Firehouse 12 Records and her first solo recording. There are no originals in the 10-song program, the guitarist choosing to blend works by well-known jazz composers (Duke Ellington, Ornette Coleman, Roscoe Mitchell, MyCoy Tyner,Carla Bley, and Oliver Nelson) with lesser known contemporaries such as Noël Akchoté, Tomas Fujiwara and Chris Lightcap. Those listeners who know that Ms. Halvorson can "shred" with the best of them will not be disappointed. The album opens with a rousing reading of Mr. Nelson's "Cascades" that hews close it the melody until the guitarist takes its apart during the solo. Although Mr. Lightcap's "Platform" starts quietly, the music takes a quick pivot to the outside, with chords one might hear from Neil Young with Crazy Horse. There are several transcendent works on the album including the prayer-like reading of Mr. Ellington's "Solitude", a John Fahey finger-picked approach to Mr. Coleman's "Sadness", and an Andulusian-inspired reading of Annette Peacock's "Blood." Mr. Mitchell's "Leola" sounds as if the song was written for the late Lou Reed while Mr. Tyner's "Aisha" gets a gentle approach until the piece explodes, then immediately returns to its quieter self. Yet the solo section has a skewed feel, the bent notes and rapid-fire phrases disassembling the melody and stripping away any of the excess emotional content, reminiscent of the work of the late Kurt Cobain. There is also a progressive rock feel to the opening half of Mr. Fujiwara's "When" (whose group The Hook Up the guitarist has been a member of since its inception); when the piece slows down, Ms. Halvorson breaks the melody down into fragments. "Ida Lupino" (one of Carla Bley's earlier compositions) gets a Bob Dylan treatment without sacrificing the melody (listen below). "Meltframe" is music for adventurous minds, those listeners who enjoy a challenge. Yet, this music is not difficult as much as it is expansive and informative. Mary Halvorson has proven time and again her music follows it own paths, her influences long ago absorbed, her eyes and mind always looking for new landscapes. For more information, go to www.maryhalvorson.com. "Impetus" is the 3rd release (all Quintet albums) from trumpeter/composer David Smith and 2nd for BJU Records. Guitarist Nate Radley has been in the group since its inception in 2005 and is an excellent foil for the leader. Filling out the ensemble is bassist Gary Wang (who's also featured on "Anticipation", Smith's 1st BJU disk), Dan Pratt (alto and tenor saxophones), and Anthony Pinciotti (drums). Smith's compositions all have good, strong, melodies, and intelligent voicings (listen to the blend of trumpet, guitar and tenor sax on the opening and closing themes of "Bond") plus he leaves plenty of room for solos. The insistent drive of "Starr St." is created by the rhythm section but pushed forward by the guitar Radley provides a second solo voice with Pratt's tenor then goes into overdrive for the trumpet solo, his raucous chords provoking Pinciotti to drive harder. "Seven", which gets its harmony from a movement of Beethoven's "Seventh Symphony", reminds this listener of the driving rock tunes of John Lennon (especially "Happiness is a Warm Gun") - Smith's solo pulsates forward, pulling the rhythm section with him. When he hands off the solo to Pratt, the intensity lessens for just a bit before picking up again. "The Toaster" burns, from the fiery rhythm section to the rapid-fire theme to the blistering trumpet solo and incendiary tenor spotlight. The final track, "Intersection", opens with a sweet trumpet melody over bluesy guitar chords. Smith stays in front for over 5 minutes of the song (total time = 10:45) before giving way to a fine guitar solo. Radley starts by playing chords before going into fast single-note runs yet always returns to chords. The trumpeter builds the intensity towards the climax, adding the saxophone to push forward over the hard-edged work of the rhythm section. There's much to like on "Impetus", from the excellent compositions to the fine interactions of a working band. Everyone gets the opportunity to shine especially guitarist Nate Radley who is the lynchpin on the majority of the cuts. Give David Smith a close listen, it's worth your time. David Smith also shows up on "Scenic Design", the second BJU recording for pianist and composer David Cook. He shares the front line with saxophonist and producer Ben Wendel while the rhythm section features the expert work of Matt Clohesy (bass) and Kendrick Scott (drums). Cook has served as musical director for vocalists such as Taylor Swift, Lizz Wright, Marianne Faithful and his wife Shayna Steele plus has played in the large ensembles of Alan Ferber, J.C. Sanford and Travis Sullivan's Bjorkestra. His 2010 BJU debut, "Pathway", was an impressive trio session that also featured bassist Clohesy in the rhythm section along with drummer Mark Ferber. This program covers a wide swath of musical territory, from the trumpet/piano duo on Ms. Swift's "Safe and Sound" to the inspired reimagining of Jerome Kern's "Long Ago and Far Away" to the lovely ballad "I Know You Know" (co-written by and featuring Ms. Steele). Cook is quite an expressive pianist, whether he's quietly playing the chords beneath Wendel's tenor sax on "Midwestern" (which has a lovely melody line) or stepping out in glorious fashion as he does on ""80s TV Theme Song", a piano-bass-drums workout that has splendid solos from everyone involved. Anyone who knows the work of Kendrick Scott knows the drummer rarely plays it safe. His high-powered drive on "Shift" and his easy-going yet subtly intense work on the title track makes those pieces stand out even more. How he drives the opening "Flower and Hope" serves to free up the soloists and he goes on to make the interweaving solo lines of Cook and Wendel more exciting. The final track, "Still", opens with a long solo piano statement (reminiscent of the work of Fred Hersch) - when the rhythm section and Wendel's alto saxophone enter, they join the pianist in the melody (note Clohesy's strong contribution) bringing the program to a gentle yet uplifting close. 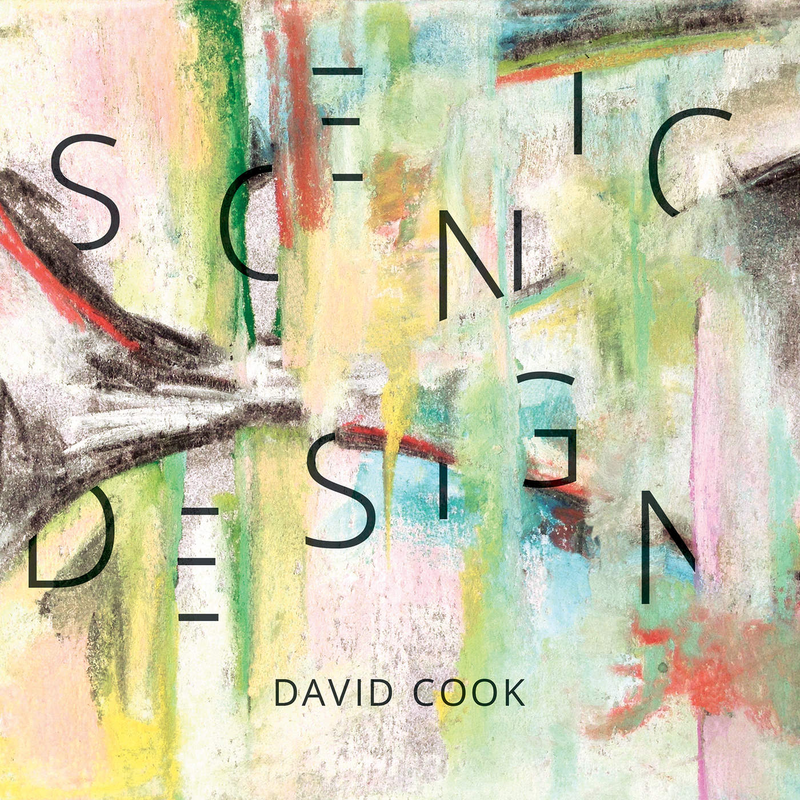 After listening to "Scenic Design" a number of times, one continues to be impressed by how David Cook has arranged this music for this quintet. One can tell the musicians were emotionally invested in the music, giving the album an undeniable positive feel. Check out these sweet sounds. For more information, go to www.davidcookmusic.com. As I write this, Harris Eisenstadt is in the midst of a week-long residency (9/01-06) at The Stone in New York City in celebration of his 40th birthday and all the great music and ensembles he's created since first arriving on the scene a few years before the beginning of the 21st Century. In the midst of the Big Apple week, Songlines Recordings has issued "Canada Day IV", featuring the drummer/composer's long-running quintet of Matt Bauder (tenor saxophone), Nate Wooley (trumpet), Chris Dingman (vibraphone) and newest member Pascal Niggenkemper (bass). What you'll notice about this quintet music is that the composer puts great stock in melodies as well as creating smaller groups inside the ensemble. And, there are times when the band is very playful. Check out the interaction on "Let's Say It Comes In Waves" and how everyone is involved in moving the melody forward (even the drummer) - that does not change until the handsome trumpet solo but pay close attention how the rhythm section plays beneath that solo. Wooley enlivens "Life's Hurtling Passage Forward" with a raucous trumpet solo worthy of Lester Bowie and Taylor Ho Bynum then adds a mute to take the song out over Dingman's mesmerizing vibes. The vibraphonist has such a full sound, does not swing in the manner of Jay Hoggard (his teacher at Wesleyan) or Gary Burton, yet his background work is integral to the success of this music. His support beneath Niggenkemper's bowed bass at the start of "What's Equal To What" adds to the mystery of the piece, an alternative universe that does not waver until the drums enter and the bassist eases into a walking rhythm. And the band knows how to let loose. Dingman dances through his solo on the uptempo, Monk-like, "What Can Be Set To the Side"; the piece falls apart and takes on a circus-like atmosphere right near the end. The closing track, "Meli Melo" (named for a Canadian snack mix), starts out quietly, just saxophone and vibes for the first 3 minutes before the sax drops out leaving Dingman to move the melody into the forefront. The bass and drums enter before the band plays a stop-and-go melody leading into an interchange of the saxophone and trumpet. "Canada Day IV" continues a streak of impressive recordings for Harris Eisenstadt. His ability to write for disparate ensembles continues to grow (the residency includes music for his Canada Day Octet and a new piece for string quartet) and, while on paper this Quintet looks like typical "jazz" lineup, the music they play is anything but typical. Engaging, involving, and challenging, yes, but not typical. For more information, go to www.harriseisenstadt.com. Depending on your work status or whether you have children who started school already, Labor Day Weekend has traditionally been viewed as "the end of Summer." With 3 shows in 3 nights, The Side Door Jazz Club in Old Lyme is doing its best to make sure it's a memorable weekend. On Thursday September 3, the venue welcomes the Power Quintet, 5 musicians (pictured above) who have made and continue to make a big impression on the jazz scene. Composed of vibraphonist Steve Nelson (Dave Holland bands), trumpeter Jeremy Pelt, pianist Danny Grissett (Tom Harrell Quintet), bassist Peter Washington (Bill Charlap Trio), and drummer Bill Stewart (John Scofield, Larry Goldings), this band brings not only year of experience but also 5 different approaches to the music. The blend of Nelson's "cool" vibes and Pelt's brash trumpet (although he does have a handsome melodic side) makes for exciting music and add Grissett's excellent playing, the front line is well covered. Washington and Stewart are much in-demand for the excellent "ears" and ability to fit into many musical situations. The doors open at 7:30 p.m. and the Power Quintet takes the stage at 8:30. 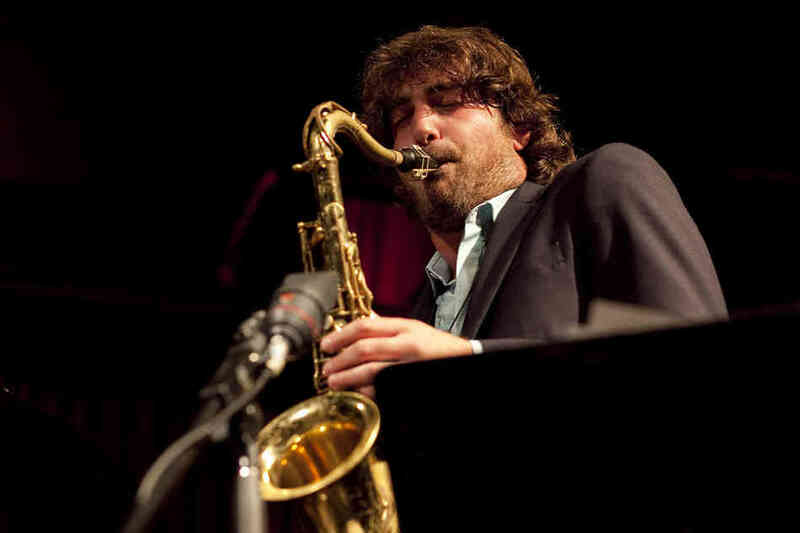 Since he first came onto the music scene in 2008, fresh out of the New England Conservatory of Music, tenor saxophonist Noah Preminger has impressed audiences and critics alike with how he approaches jazz. The Canton, CT, native has always sounded so mature, not settling for cliches or following the latest trends, with a penchant for ballads and creative interactions. Preminger has a new quartet, Pivot, a new CD, "Live at The 55 Bar" (release date is October 6), and a new approach. Having seen and heard the young saxophonist in a number of different musical settings, "pivot" is the proper description for his latest musical venture. The band - Jason Palmer (trumpet), Ian Froman (drums) and Kim Cass (bass) - reach back to the halcyon days of the Ornate Coleman Quartet and the John Coltrane Quartet and let it rip. The CD has just 2 tracks, both over 30 minutes long and both based on classic blues songs ("Fixin' To Die" and "Parchman Farm Blues") and the results are as breathtaking as they are powerful. For the Friday night Old Lyme gig, Preminger and Palmer (a delightful young player in his one right) will be joined by bassist Sean Conly and the ever-swinging Matt Wilson at the drums. As above, the band starts playing at 8:30 p.m. The Saturday night performer at The Side Door is the singer and songwriter Somi. 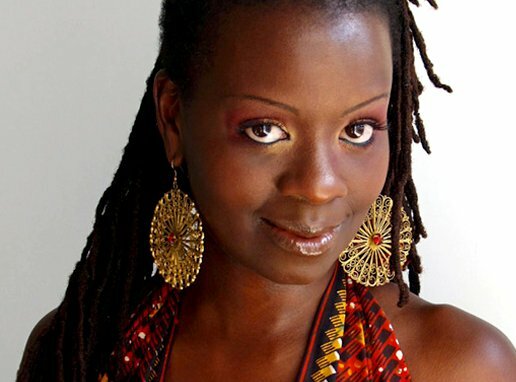 Born in Illinois to parents who came to this country from Rwanda and Uganda, Somi, over the course of 4 CDs, has proven herself to be a strong vocalist and smart composer. Her latest recording, "The Lagos Music Salon", is the result of moving to Nigeria and getting involved in the incredible African music scene - the recording blends myriad influences and is a soulful, mature, group of songs, some with pointed topics. She's bringing her splendid band including Toru Dodo (piano), Ben Williams (bass), the inventive guitarist Liberty Ellman, and a drummer yet to be announced. This show should be fascinating! Give a listen. For more information about the weekend in Old Lyme, go to the sidedoorjazz.com. Organist (and Meriden CT native) Brian Charette, one of the busiest keyboard artists on the scene at the moment, comes back to Connecticut on Saturday night (9/5) to reunite with 2 musicians he played many a local gig with in the 1990s. One of the best jazz-fusion groups, Street Temperature won numerous local awards for their innovative and exciting music. Guitarist Frank Varela and drummer Rick Marshall, who still perform together in the guitarist's fine Trio, join their keyboard friend for an evening of blues-based jams at Black Eyed Sally's, 350 Asylum Street in Hartford.They'll hit the stage at 9:30 p.m. and the music will flow until 'round midnight. To find out more, go to blackeyedsallys.com. To get you in the mood, here's Brian C from his new PosiTone Records CD, "Alphabet City" with his trio of guitarist Will Bernard and drummer-extraordinaire Rudy Royston!